The Nokia N1 comes with a 7.9" display, with a squarish 4:3 aspect ratio. 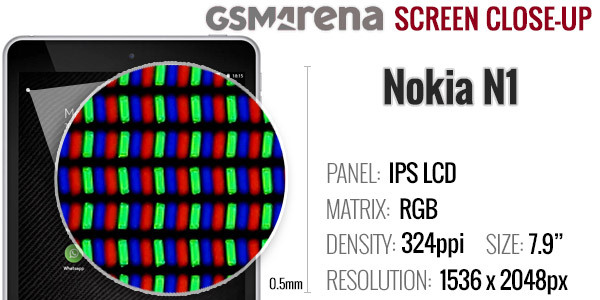 It has 1,536 x 2,048px resolution making for 324ppi pixel density. Yes, those are the vital screen measurements of the iPad mini 3 as well. The aspect ratio falls between A4 paper and the US letter standards, which makes it quite suitable for reading documents, especially at this screen size. You'd have a hard time reading a full page on an 8" 16:9 display. The display itself is decently bright though we kept the brightness slider in the upper half of its range. The Auto works pretty well too if you want to save some battery. The software can further adjust screen content to better suit the current image on the display. The contrast is good with fairly dark blacks. The glass is highly reflective though, which hurts the tablet's usability in direct sunlight. Viewing angles are great thanks to the quality IPS panel though the colors are not particularly lively. Some will be okay with that, but if you prefer punchier colors you may be a little disappointed. The accessibility options include larger text, color inversion and correction modes for a few color blindness conditions. The Nokia N1 is among the very first devices to support USB Type-C, though that's not entirely accurate. Type-C is a new reversible connector for USB that builds on top of USB 3.1. The cable supplied with the tablet ends on a USB 2.0 plug though. That's important for two reasons. First is speed - USB 3.1 Type-C cables can go up to 10Gbps, but the N1 is limited to USB 2.0 speeds (480Mbps). Second is that Type-C connectors are meant to go on both ends of the cable since the standard allows for functionality to go both ways - that's data transfer and even charging! The new standard also brings built-in video output capabilities and native fast charging, neither of which are available on the N1. Over time USB 2.0 got updates to support external storage (USB OTG) and video out (MHL/SlimPort), but this tablet doesn't do any of that. The promise of USB Type-C is that it can do everything - the one cable that powers a whole desktop setup, like Apple is doing with the new single-port MacBook. Well, that's not the case on the Nokia N1. The other wired connection the tablet offers is a standard 3.5mm audio jack. Type-C USB ports should supposedly support analog audio out too, but this one doesn't as you should have figured out by now. The tablet does have a Wolfson chip so audio quality should be on a good level, we'll test that in a few chapters. For wireless connectivity, the Nokia N1 has Wi-Fi a/b/g/n/ac and that's your sole connection to the Internet. There is no optional 3G/LTE connectivity, at least not yet. There's also Bluetooth 4.0 with A2DP. Now for what's missing. There's no GPS positioning, which should matter to you if you're wanted a compact tablet for navigation. There is no NFC either. The Nokia N1 has a relatively small 5,300mAh battery, 18.5Wh by a different measure. The Apple iPad mini 3 packs a 6,570mAh, 24.3Wh battery. That's 30% more capacity, though the iPad is slightly thicker. If we could choose, we'd pick the thicker tablet with a bigger battery. In fact, 6,500mAh or so seems to be the norm for tablets around the 8" mark, except for the Sony Xperia Z3 Tablet Compact, which has only 4,500mAh. Sony's tablet is even thinner, but the Z3 has a spectacular battery life. Similar story with the Galaxy Tab S 8.4 - a 4,900mAh battery lasts a long, long time. 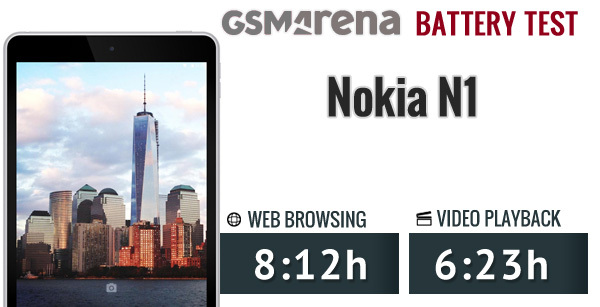 The Nokia N1 only managed half the battery life for web browsing and watching videos than the Z3 tablet. It compares more favorably to the Tab S 8.4, at least in the video test. The iPad mini 3 goes for at least 4 hours longer than the Nokia tablet on both tests. We'd point our finger at the battery capacity, but the reality is that both Sony and Samsung stretched smaller batteries to excellent battery life. The Nokia N1 could use a good deal of optimization, hopefully a lot can be done in software as the screen and chipset are fixed and the current results just aren't very good.